Akron police say a 17-year-old is under arrest after an incident that caused a lockdown at the University of Akron early Saturday morning. The university was placed on lockdown around 1 a.m. Students received a text message to shelter in place. It was lifted less than a half hour later. Police believe the shooting may have been an accident. 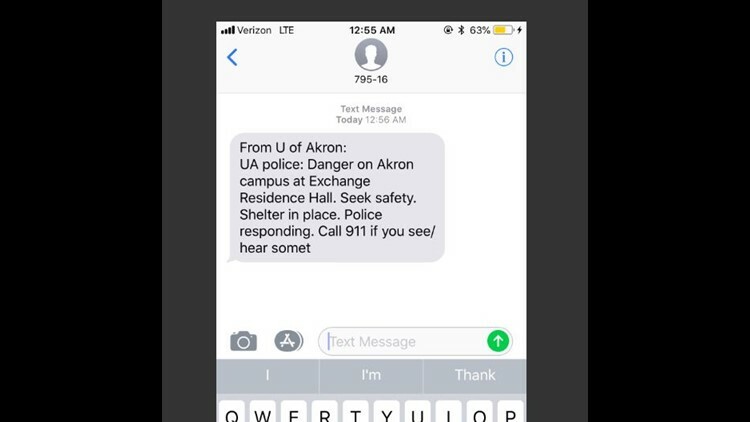 "Two non-University of Akron (UA) individuals were involved in what appears to be an accidental weapon discharge situation at UA’s Exchange Street Residence Hall earlier this morning" said Akron Police Department Chief James Weber. Webber says the victim, a 19-year-old man, was taken to the hospital with a gunshot wound to the abdomen. He is currently being treated. A 17-year-old has been arrested ans charged with unlawful discharge of a firearm. Police say the two knew each other and neither were UA students. "The University of Akron (UA) cares deeply about our campus community, and we are steadfast in our commitment to the safety and security of our students, employees, visitors and guests. "UA prohibits firearms in residence halls and requires resident students to have responsibility for the actions of any guests. This incident underscores the importance of this policy. "We understand that this situation was very concerning for many people and University representatives from the Division of Student Affairs and Residence Life and Housing have been on scene and providing support to other UA students. They also will be discussing campus safety and additional ways to improve our efforts with students in the days ahead. "We appreciate the cooperation of all parties as University officials and the University of Akron Police Department (UAPD) continue the investigation. As a community, we also encourage students to remain diligent advocates for safety. If you have information that can assist investigators, please notify UAPD at 330-972-2911. "Counselors will be available for students by calling 330-972-7082 or visiting Simmons Hall 306 on Monday. Students seeking immediate assistance should contact Residence Life staff who will connect them to the counselor on-call."